The Lagos state University (LASU) authority has explained that its certificate found at Suva spot in Epe was invalidated since five years ago. 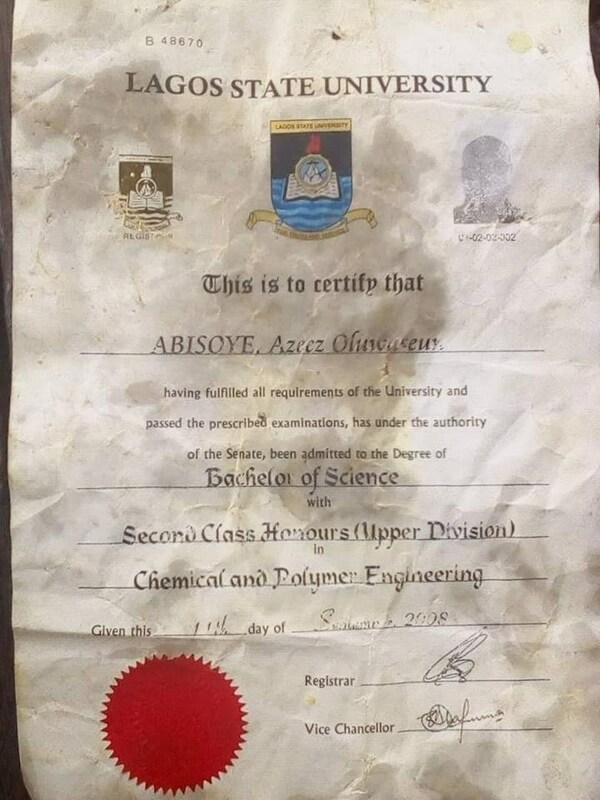 The explanation follows recent trending report of discovery of an original Lagos State University degree certificate belonging to one Abisoye, Azeez Oluwaseun, a second-class upper graduate of Chemical and Polymer Engineering on November 19th at a suya spot in Epe, Lagos. The LASU management said the Certificate was invalidated due to wrong spelling of name. The University’s Centre for Information, Press and Public Relations Department gave these explanations in a statement on Wednesday 5th December, 2018. “The ‘certificate’ in question actually exist but was invalidated on 25th February, 2013 because the graduate’s surname was wrongly written on the ‘certificate’ as ABISOYE instead of ABIOYE. “The University had issued another certificate carrying the correct surname and this was collected by the graduate on the 30th of September, 2014. “By the University’s standard practice, the invalidated certificate ought to have been shredded immediately the certificate was re-issued with the correct surname. “Obviously this was not done and by default the invalidated certificate got into the public space due to improper screening of office waste papers, prior to disposal. “Mrs. Adeyemi ADESANYA, a seller of soft drinks at a location near the Epe campus, who recovered the invalidated certificate near her shop, posted the image on a social media platform, supposedly for the attention of the ‘owner. “Although, the social media post by Mrs. Adeyemi ADESANYA was a source of embarrassment to the University, however, the University Management wishes to assure all stakeholders and the general public of its determination to sustainably preserve the sanctity and integrity of all validly issued certificates by the University. “Towards this end, the University Management has taken immediate actions to forestall such unpleasant incident.